The other day, I went to look at bird books in Portland, Oregon, at Powell’s City of Books, which is said to be the world’s largest independent bookstore. 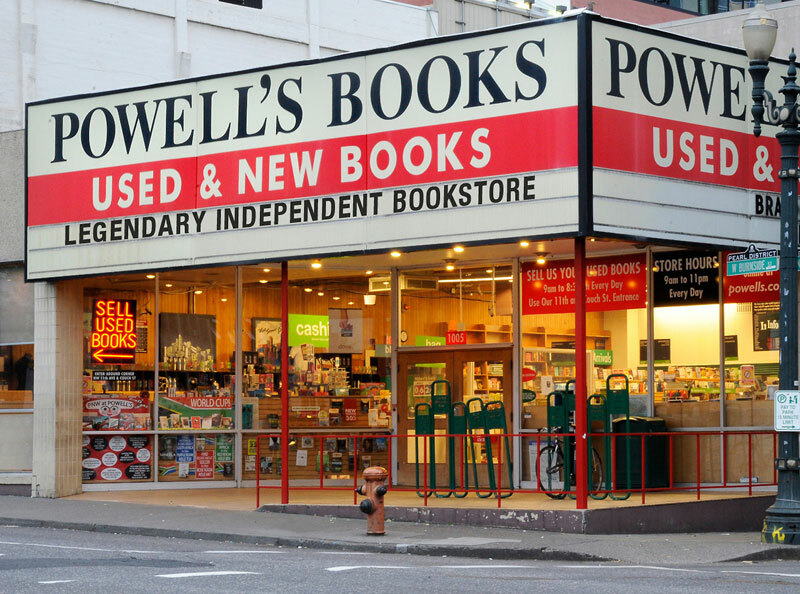 Powell’s is a High Island-style fallout of printed pages. The store covers a downtown city block with several floors and 1.6 acres of retail space, holds a million titles, and sells 3,000 used books a day. As I stepped inside, I was handed a color-coded map, which reminded me of a wildlife refuge brochure, to help navigate the many rooms. It turns out that bird books are no longer housed in the main Powell’s building, which has run out of space. They are now filed with other science, math, and technical titles in an annex across the street. I followed my map outside, dodged some cars, and walked through another set of doors to reach the south-facing indoor wall of Powell’s Building 2, which is blanketed by heavy shelves of bird literature. The books are categorized by subject, and I happily began browsing. This is probably the moment to admit that my visit to Powell’s had an ulterior motive: I wanted to see if they were stocking my new book, which came out this spring, and I was pleased to see six copies displayed on the “bird behavior” shelf. When I first spotted it, I glanced around to see if anyone was watching, pulled a fine Sharpie out of my pocket, grabbed the top copy, opened it to the title page, signed it, and then put the book back on the shelf. Guerrilla-signing my own book, right there in the store, gave me a little rush. I figured someone would be pleasantly surprised, if anyone ever bought it. The guy seemed surprised, but he picked it up. “What’s it about?” he asked, and I gave my elevator pitch about parallels between bird and human behavior—how, when we study birds, in the end we are also kind of studying ourselves. He opened the cover. “Hey, it’s a signed copy!” he exclaimed. I just smiled. “Guess I should get this one, since I met the author,” he said. We talked birds for a while, and he checked out and left. There are so many bird books these days. A large poster for the new Sibley guide is displayed in the front window of Powell’s, a literal sign of birding’s increasingly mainstream influence. But it’s still a niche pursuit. During my visit to the bird section, nobody else came to peruse the shelves. That’s OK with me—in one sense, all bird books, no matter how thorough or elegant, are secondary sources. Birds give us plenty of inspiration all on their own.